Today, we have a cycle of cards that all show up in the From The Vault: Jace set. You may wonder why we used up a full third of a 15-card set on a cycle, but we have good reason. Here at GoodGamery R&D, there is a saying that nothing is as hard as designing a well-balanced cycle of cards. 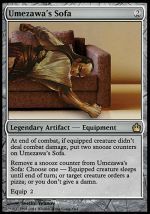 If a card is face down, that means it’s a 2/2 creature. That means you can attack with your library – this is how I win games of Magic: The Gathering. It’s a lot less hassle to have each player draw a card than to limit it to a specific target. You don’t have to aim, or remember the name of the loser who summoned you or anything like that. It’s just a nice impersonal incantation that lets everybody have a good time with their cards. By the way, I’ve been at this card drawing business for a while, and “target player draws a card” is really just a euphemism for “You draw a card.” No one ever gives someone else that card, not even for Christmas. Magic: The Gathering has a long history of printing color hosers. These are cards like the famous [card]Hydroblast[/card] and [card]Flash Flood[/card] that literally hose down red opponents with water. With Kormus Belleren, you can turn your opponent’s powerful Planeswalkers into weak, mewling cadets.